Men's grooming products remain one of the most dynamic areas in cosmetics and toiletries in the UK with sales exceeding £771 million at the end of 2005. And it's no surprise that there is also an increase in male spas and grooming parlours. In fact men now comprise 30 per cent of the spa going public. Spas that cater solely for men usually provide their guests with a higher level of individual privacy than is usually provided by unisex or women-only spas (individual private hot tubs, waiting rooms etc. Yet many men are wary of entering into a spa because they really don't know what to expect from the treatments. So, for those of you who have never had a facial or a manicure, here's the run down on what happens in a male spa. Services that are immitable to men mostly involve facial skin and shave treatments, though other treatments can also be used to tackle male issues - like chest, back, and arm hair removal. disparities of the hot shave appear to be the most common offering - they usually include, a hot towel, a neck and facial massage, and a shave with a flat edge razor. 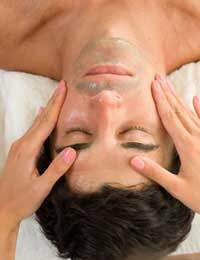 Different spas offer various massage techniques including Swedish, deep tissue and shiatsu, many also offer acupressure and reflexology. One of the newest and most relaxing techniques now available is LaStone or hot stone massage therapy, during the course of which the therapist uses warmed river rocks to stimulate circulation and ease tension in your body. A body wrap is both invigorating and excellent for removing toxins from the skin. Herbal body wraps can also detoxify fat cells, soften and tone skin, reduce or remove skin blemishes, smooth the appearance of cellulite and some even claim to be able to reduce your body fat, removing several inches from your body. A brown sugar scrub not only exfoliates your skin but completely invigorates your whole body. Many sugar scrubs contain a combination of lemon and ginger to stimulate your metabolism. A 30 minute sugar scrub followed by a refreshing shower can leave you feeling like a new man. The face is first cleansed to remove any external debris or pollutants usually using a mild foaming wash. The skin is then exfoliated to remove any dead surface skin cells and to soften and smooth the skin. Next an extraction mud will be applied to draw out any impurities from the pores. This will be left on the skin for a few minutes and then rinsed off. Finally a moisturising and rehydrating lotion will be applied. Nails are cleaned and trimmed and rough edges are filed smooth. Cuticles are pushed back and sometimes a clear nail polish is applied. Some male spas and grooming parlours offer a herbal or aromatherapy bath as part of their treatment. It is a great way to relax as well as allow the herbs or essential oils to do their healing.